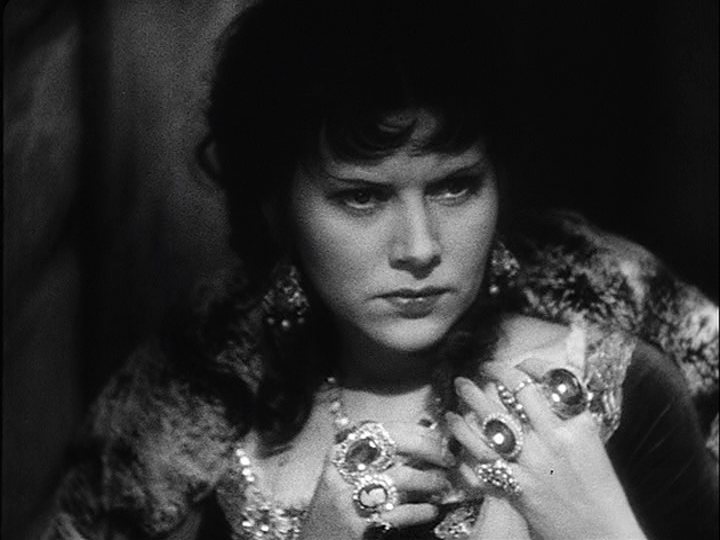 In THE SCARLET EMPRESS, her best-known movie, Ruthelma Stevens is understandably blown off the screen by Fraulein Dietrich, but when I saw her in her two movies with Adolphe Menjou as DA/sleuth Thatcher Colt, I was impressed by her quality of seriousness and intelligence. But, for whatever reasons, Ruthelma never made it as a star — her turn as Sam Jaffe’s mistress in SCARLET EMP was virtually her last credited role. Sternberg obviously remembered her though, because he used her again for a bit in JET PILOT, which seems to be her last film of all. Among the movies she graced in her later years, wearing her years graciously but quite openly, is Val Lewton’s last movie as producer, which happens to be the subject of this week’s edition of The Forgotten: in APACHE DRUMS, Ruthelma plays dance hall proprietor (read: madame) Betty Careless. Here’s more on Ruthelma (that NAME!) from an avid fan.